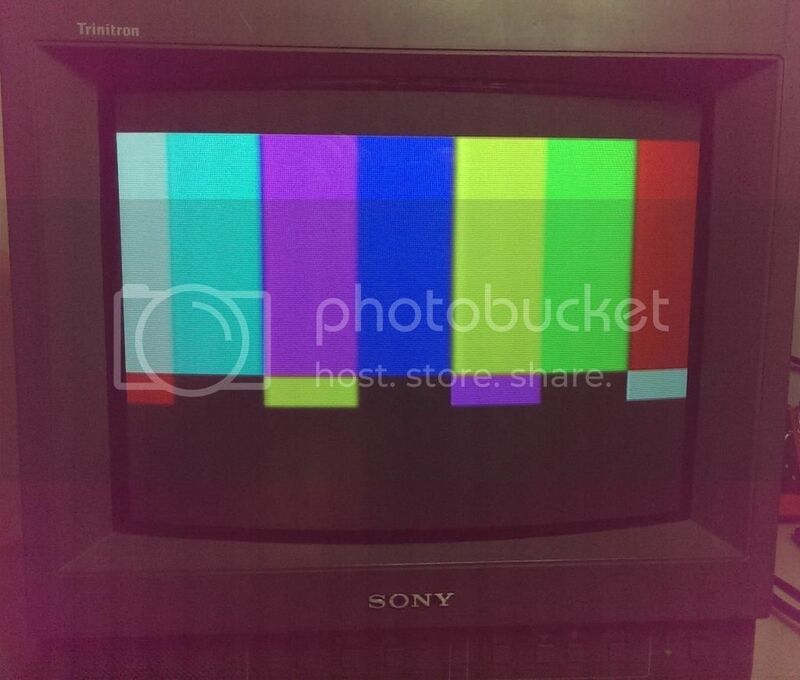 This model PVM does not have any color adjustments to be found, inside or out. There is no degauss button. There IS a degauss coil, which does not appear to correct the problem on power-up. Checked Line A Y/C, Line B Y/C, and RGB inputs. They are all affected. So, I burned a DVD containing a SMPTE test pattern so I can see what colors are trying to display, and played it through the Line A Y/C-In jack. Attached is the results. First, the pattern I was trying to display (just some image from google that matches). Then what is actually displaying on the monitor. I hope someone has seen this behavior before. It's pretty confusing, since it's not blotchy like someone stuck a magnet near a corner.. it's just .. all incorrect. You will see that Black is Black, and White is White. All else is wrong. 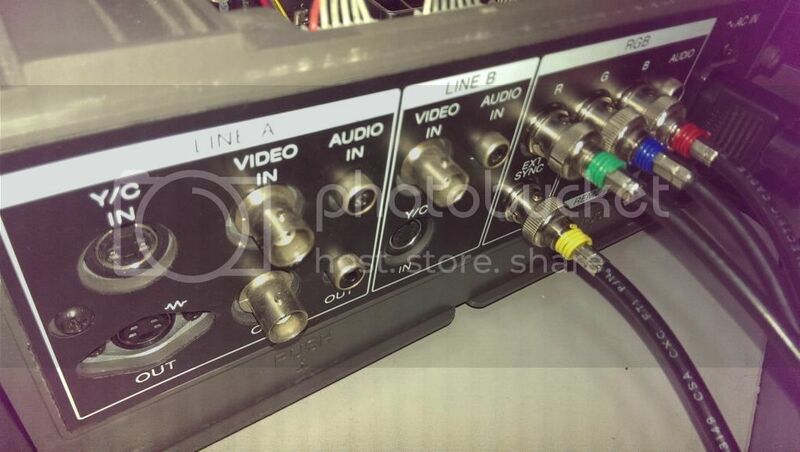 Does this set have component compatiblity ? If yes, then the color decoder is likely set wrong (RGB instead YUV or vice versa). No component input on this set. Closest is the RGB with Ext Sync. When you say color decoder, are you referring to the cxp chip that controls the palette? Not the microcomputer IC but the other one Sony uses? 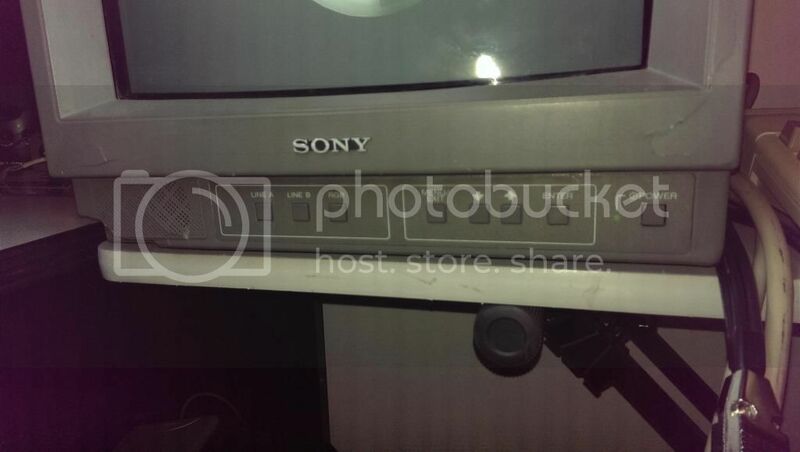 I have the same problem with a Sony PVM-14L4 monitor I've just bought. The problem is that where red should be displayed, green is being displayed; where green, blue and where blue, red. On TV sets where the RGB signals are fed to the CRT base board on individual wires it's possible to get this effect by rotating the wires so that the sequence changes from RGB to GBR. However, I've had the lid off my monitor and it isn't of this type. I also have a problem with a purity error towards the right of screen (degauss button operates but it doesn't cure). The wrong colour problem must be in the RGB section of the monitor as the on-screen menu colours are wrong too. I'm a broadcast engineer with some 30 years' experience so, having some decent test gear, I should be able to figure out where the problem is once the service manual arrives in a couple of weeks. I've also posted the problem on an international forum for broadcast engineers (principally interested in the earlier broadcast videotape formats) in case someone has come across this problem. Hopefully the HR Trinitron CRT is ok and the faults lay elsewhere. I couldn't get out of my head the subtraction process for component (which doesn't apply with the N6U of course, being a composite and Y-C only monitor, but the 14L4 is a high-end unit with component inputs), and was thinking that maybe some colors were being added or subtracted wrongly, which seems to be what you describe. Definitely very interested to learn about your findings; good luck! If it was interpreting it as component video, the screen would look mostly green. Assuming the RGB is wired correctly internally, anyway. Why are you using s-video anyway? I would just connect it by RGB, rotate the wires so that it's correct and call it a day. The monitor uses BNC connectors for RGB+ESync, not typical RCA inputs which most "component" inputs in the US are. I was using the S-Video connector because I don't have RCA-to-BNC connectors/cables. I made a DB9-Sub to BNC using some BNC network/signal cables to hook it into an Amiga, which displayed the same wrong color scheme. I imagine since all of the color guns are firing, just in the wrong place, I could just pull the Red Green and Blue and switch them around, but if there's a chance it could be a simple fix that could correct all inputs, why not? Short reason, I want this to be a test bench monitor for testing JAMMA boards (RGB), Amiga (RGB), Commodore 64/128 (Y/C), and consoles (various), so I was hoping to get all the inputs displaying the correct colors. RCA to BNC is just a matter of adding $1 adapter plugs. But the interesting part is still that white remains white and black remains black. You simply get blue instead of green, red instead of blue and green instead of red. With a RGB source, what happens when you simply switch around the color cables ? It would seem that you should be able to get proper colors with one combination. For example, if you have a source with a blue screen, the B line would have a 0.7V signal, while the other two color channels would have 0V. Now you just need to find out which of the BNC inputs give you blue on screen. OK, I finally did a little study of this using Irfanview's "swap colors" function. It's almost as if you had three bytes for color, and rotated each left (wrapping around). This is exactly what horde5150 is saying, of course. 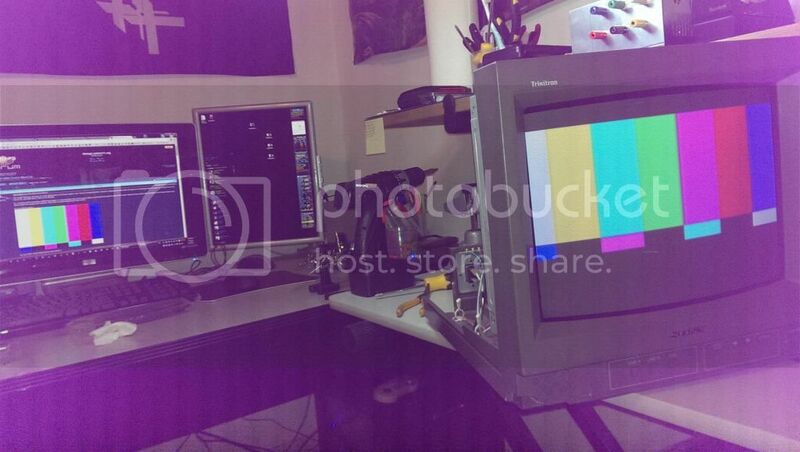 I found with my Sony PVM-14L4, which is exhibiting the same problem of wrong colours, that feeding the monitor with composite video (CVBS) 75% colour bars resulted in the correct drive waveforms being measurable (with an oscilloscope) at the CRT base socket. On the copper side of the PCB the silk-screen printing here identifies these pins as KR, KG, KB (K stands for Kathode/Cathode). Remembering that the large amplitude signals here are negative-going for increasing brightness I found exactly what I expected: KR is low for bars 1,2,5 and 6 (1 = white, 8 = black); KG is low for bars 1,2,3 and 4; KB is low for bars 1,3,5 and 7. So the CRT drives are as they should be and the problem would appear to be due to the electrons from the three guns landing on the phosphor next to the one they should be landing on (Trinitron CRTs comprise vertical stripes of phosphors in sequence RGBRGBRGBRGB... So maybe the shadow mask inside has shifted as it's this which ensures the three beams land only on their respective phosphors. Workarounds may be possible, but that's the issue - at least with my PVM-14L4. I am sure you have already dismissed these possibilities, but so that I might learn something, is there any chance the K voltages are lower for this model alone? Or that deflection, or something else past the drivers for the tubes, is off enough to make this difference? Also curious to know if there's any sign of damage or parts going out of alignment that could cause this. I doubt it would be that easy, but it came to mind also. Funny you should ask! There appears to be some physical damage to the casing around the lower-left and right front of the casing. 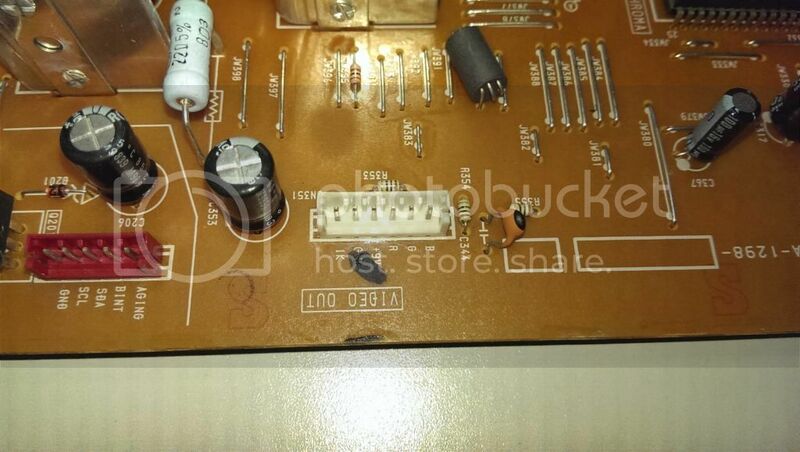 I did remove the PCB and neck board chassis for inspection of physical damage. It appears the only thing that took a hit was the case. 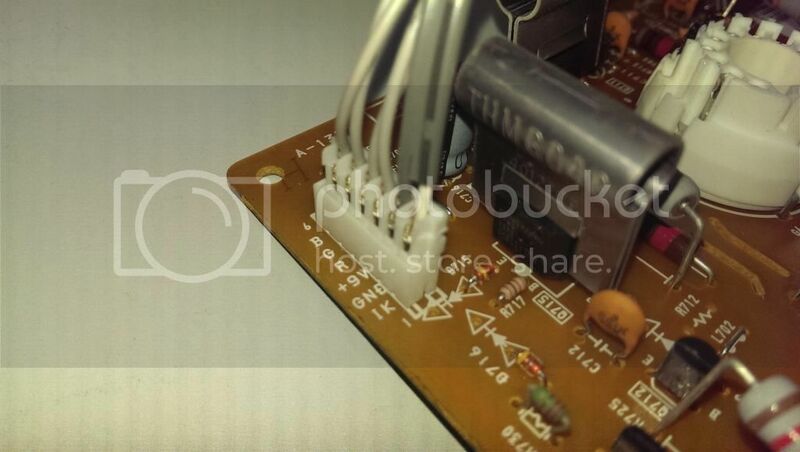 Using a magnifying glass on both sides, I couldn't find a single scratch, stress mark, bad trace, bad solder, loose chips/cables/anything inside. I also tested the theory to be correct on this monitor by hooking the Amiga to the monitor by swapping R-G-B into G-B-R. It displayed the desired effect. Mind the signal labeling. Those are paperclips. 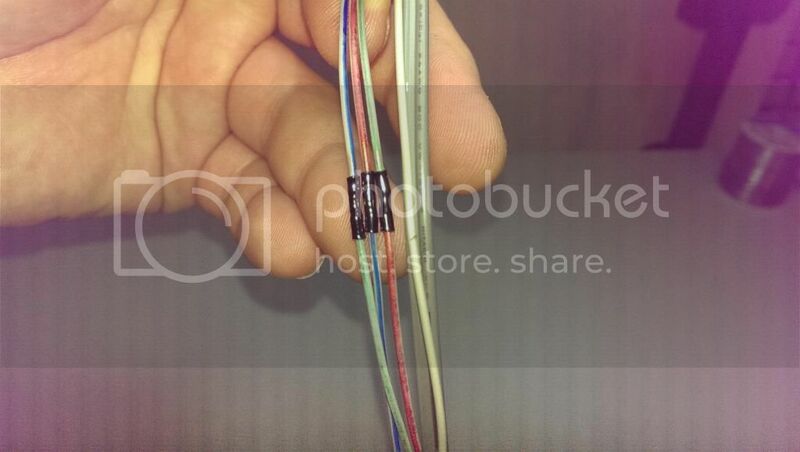 ..going to the neck board in the same tiny connector. I wonder if swapping the RGB signals here would swap the colors for all inputs. Has anyone seen/experimented with this connection before? Am I completely wrong in thinking these can be swapped? Is it just me, or is more of the black border visible on the left, than of the right, of the tube in the first pic? Your eyes do not deceive you. The black border which signifies where the tube cannot display graphics is more visible on the left side of the screen by a few mm. This is noticeable even when the monitor is powered off. I just cleaned the edges of the visible tube just to make sure nothing is hidden. You are not seeing things. After looking at the gap between the plastic front face and metal frame holding the CRT on the left side vs right side though, there is more space on the right, which sounds weird given the black border is thicker on the left. It could just be a Sony thing. But then again, this was an Ebay purchase, so there's no telling where in the event horizon this monitor has traveled. 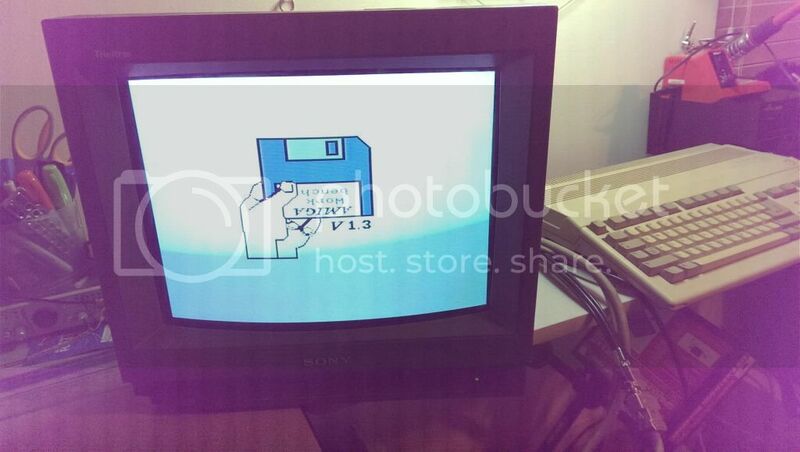 It still displays a great picture from the Amiga, full color, PAL, NTSC, bright, even interlaced. The head-scratcher is still that the colors being fed to the monitor not what displays. GBR instead of RGB. I now have an Amiga 3000 hooked into it. Looks great. But it's hooked up GBR instead of RGB. And I've just discovered that the hard drive has bad sectors. Awesome. 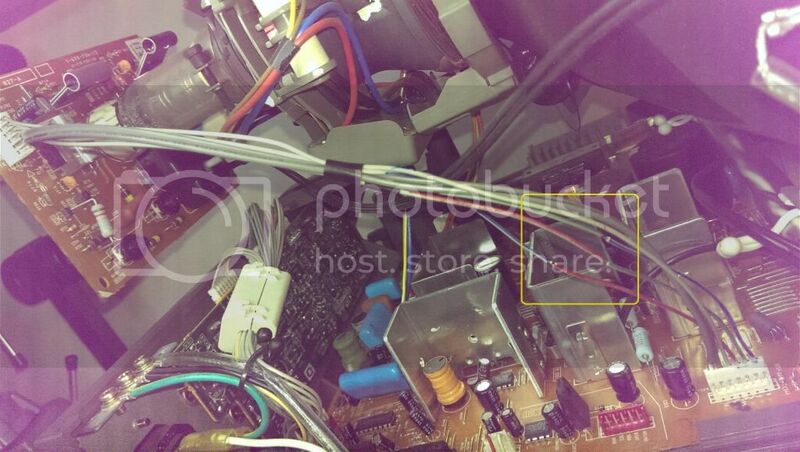 It's very common on the N series PVMs for the CRT to become loose and shift around the case. You can correct this by opening up the case, loosening the four screws that hold the CRT to the bezel, and reorienting the CRT. Considering this particular one has been dropped, it's not surprising it happened. I nudged the CRT over a few mm. A little better but not perfect. Unsure still what is causing the GBR instead of RGB display. I hooked a lead to ground and tapped the R G B signals on the neck board to see what flashes on the screen. Tapping R gave me Green, G gave me Blue, and B gave me Red. 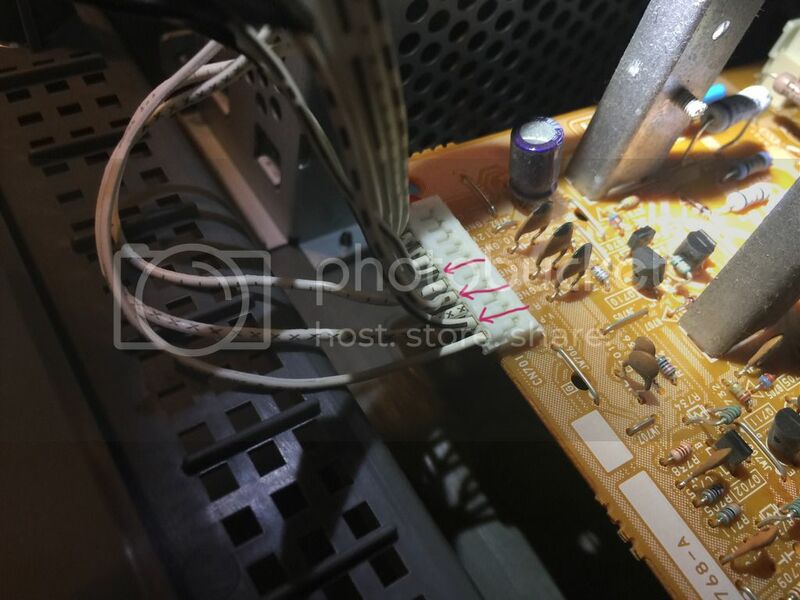 How possible is it that the CXA2060BS chip has gone wonky? I'm not able to reach that far into the monitor while all the wires are connected to check the RGB output signals on the chip. E-Bay has them for $10.50. I may try re-routing the RGB signal wires going to the neck board from the Video Output connecter on the chassis. It would save from ordering a replacement IC (that may have similar issues, since they are pulled ICs) only to possibly have it happen again in the future. 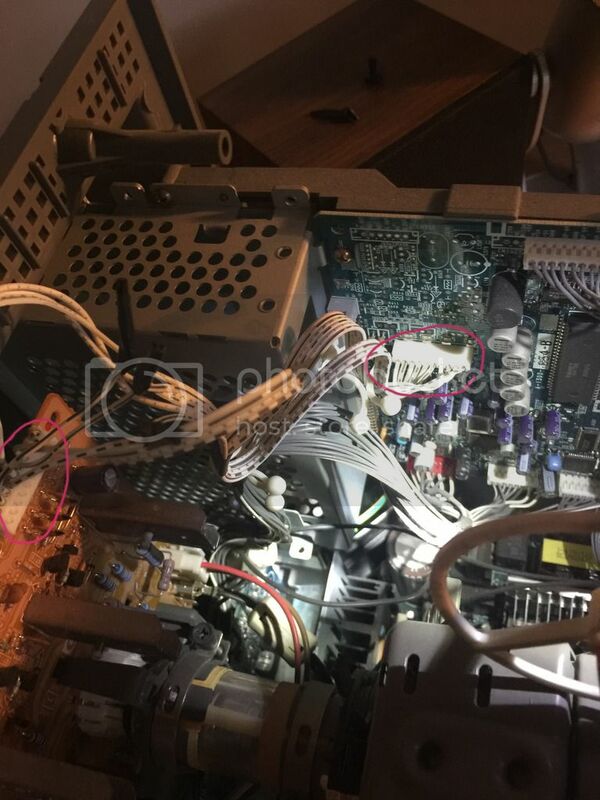 Swapping the RGB wires from Video Out from the chassis to GBR on the neck board got the picture displaying the correct colors. I want to thank everyone who assisted and could provide info. Hopefully this will help others in the future that just need a cheap and simple fix for this bratty issue. I picked up a 14N6U recently and fortunately did not have this color swap issue. Strange that some made it through QA that way. I'm guessing they knew about it but figured they could just tell the customers that the external labels got mixed up. Anyway, I was very pleased to discover that the PVM-14N6U can accept C-video as an RGB sync source. Tested with SNES and Genesis standard SCART (without c-sync cable mods). I didn't see this mentioned in any searches so I thought I would put this here. Sorry for the bump but I wanted to chime in here to say that I bought a new Sony PVM-14L2 and it had the same symptoms with the RGB swapped around and the fix provided by the OP worked like a charm. Here are photos to show model differences. The only three cables I swapped were the ones labelled R, G and B.